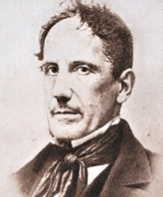 Giuseppe Gioachino Belli was an Italian poet of the 19th century who was most famous for the sonnets that he wrote in the Roman dialect called Romanesco, a derivative of the Italian language that is still spoken today. In later life he worked for the government as a censor of “inappropriate” literature and art. He was born Giuseppe Francesco Antonio Maria Gioachino Raimondo Belli on the 7th September 1791 in Rome into a family of lower bourgeoisie status. The family were living in the coastal town of Civitavecchia when his father died of either typhus or cholera. His mother could not afford to keep her children there so they moved back to Rome, living in very modest surroundings. Giuseppe had a talent for writing from an early age but it was not until he was encouraged by a fellow poet, his friend Francesco Spada, that he began writing seriously with sonnets being his favoured style of poetry. He was perhaps fortunate to meet a woman who was financially very well off and they married when he was 25 years old. His now comfortable circumstances allowed him the luxury of travelling to different parts of the country to study literature and to enjoy the fruits of the Europe-wide “Age of Enlightenment”. He was not totally against the papacy though and, in 1849 which was the time of the democratic rebellion of the Roman Republic, he steadfastly defending the rights of the Pope. As mentioned above though Belli will best be remembered for his considerable volume of sonnets, numbering over 2,200 pieces. Taken as a whole body of work they give the reader an accurate view of what life was like for the ordinary people of 19th century papal Rome. He pulled no punches and, in fact, asked a friend to destroy them shortly before he died. Fortunately the collection remained intact and they were published in edited versions, mainly so that the tastes of the time were not offended. Giuseppe Gioachino Belli suffered a stroke and died in Rome on the 21st December 1863. He was 72 years old.